(I’m betting there is but an odd reader, of the oddest kind, standing on their head). So after completing that highly successful Stop Procrastinating Now! course, then waiting nineteen years to get my act together, guess what? I came home. 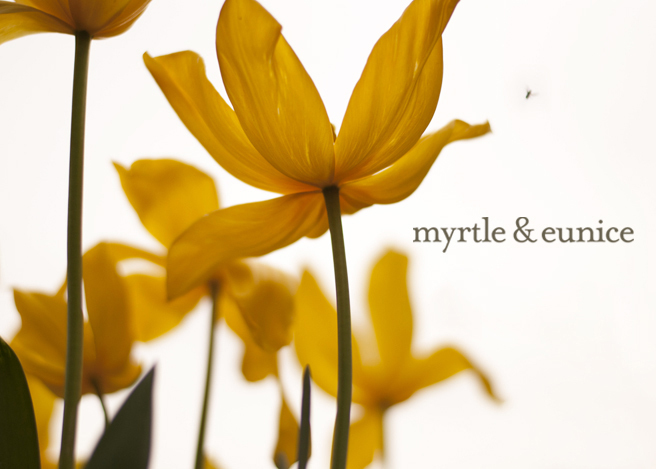 This Myrtle And Eunice is not done with screenprinting. WHAT. TOOK. ME. SO. LONG?!?!?!?!? (There’s a moral in there somewhere). PS. I promise I’m not letting any cats out of any bags – these aren’t for the swap. PPS. Unless I hit a brick wall, in which case I hope like heck March is far enough away for these to be long forgotten. Noice job! I really like the dishes one..and the leaf one...bit scared of critters so not sure I could love that one. You go, Girlfriend! (as they say in those Anti-procrastination, self empowerment kind of shows) Lisa. wowie...you've got a talent!! can't wait for more experiments from your hand. fabric printing is so great, but it is difficult to do at home, don't you think? they're all great, esp. that skipping song one, pretty darn clever. You've got a winner or three there. I'd like to place an order please...one of each to start with. I'm not joking. You know when you see something and think "I really wish I'd thought of that! ", well I do, but you did first and they're all terrific. Well done. Lovely. Those are fantastic! I love all 3. I am absolutely smitten! I love the buggy one. 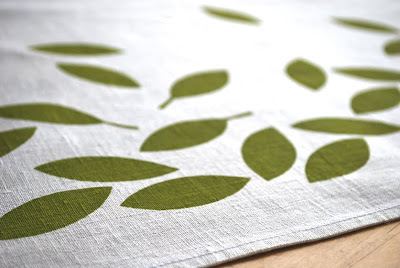 I would love to do some screen printing, yet another craft on the list. 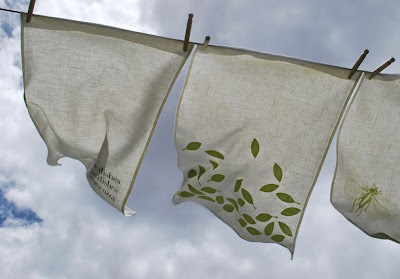 I've done simple stencils and stamping on fabric but, there is a whole world of possibility. Well done! Can't wait to see what else you have up your sleeve. They are all lovely. I get that same feeling, why didn't I do this sooner? Like making a cheese cake, thought it would be so difficult and of course it wasn't. We live and learn. If only I could stand on my head to read it! Now that is just genius...aren't you glad you finally had a go. Sttiches and Craft better look out! ok, I am inspired now! I just signed up for the swap thanks to you mam; love your creations, especially the "wash the dishes..." one, we recite that one to our babies and 'flip' them over for the "turn the dishes over' part ~ such fun! I love all of them but especially the turn the dishes over one... That one took me right back to my primary school days! I think I could dry the dishes AND do the accompanying dance at the same time. I love the designs esp the rhyme. It is cool! But you can't put that on a tea towel can you! Loving those tea towels. Now, a bit more of that just-doing-it-and-stop-thinking-too-much-about-things and you might just have a whopper of a product range before you know it. Especially the one with the text..... and the others as well. Oh you are such a clever one. I particularly love the 'wash the dishes' one. I loved singing that when I was a kid. I taught my 11yo that a couple of years back too and think I'll give Ivy a go tonight. oh well done - one good rhyme deserves another - better late than never. Wait that's not a rhyme. Aah well, mothers - so unreliable! They are excellent - Love the rhyme. You really are a clever cookie! aahh, I remember that rhyme. I never got why you had to turn the dishes over though? I like the rhyme one best. I also like the critter one - pretty. They look brilliant and the print is so clear and crisp. I love the skipping ditty. Cute. My heart skip sa beat when I see your critters. I would PAY to have that tea towel...I feel another cushion coming on. Truly, he is too nice to be drying dishes!!! D.I.V.I.N.E Tania just divine. 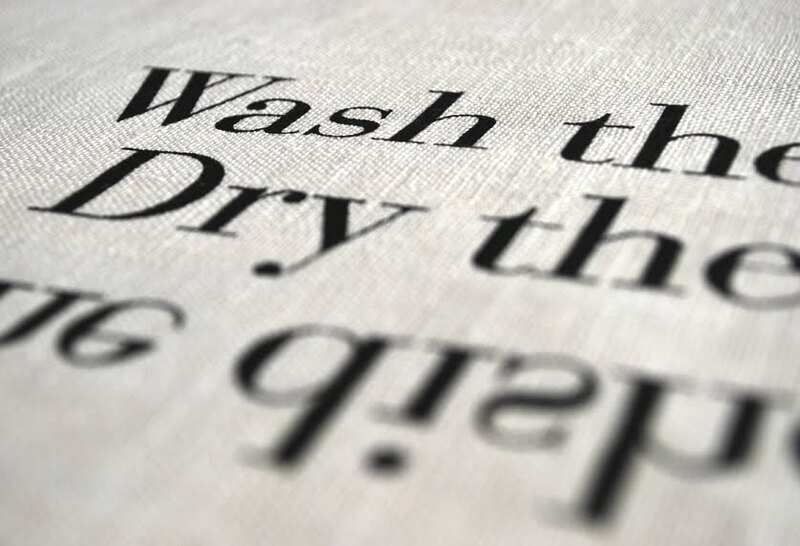 Please don't stop screen printing! Oh they are SO, SO GOOD. You are making me want, nay, need, to do a screenprinting course, um... NOW?! Those are incredibly beautiful. And, I wasn't exactly on my head, but my head was turning sideways and nearing upside down before I realized you had it written rightside up in the post. Oh. my. I think I need more sleep. Utterly stunning. I hope you're breathing out now. Love them, love them, love them. 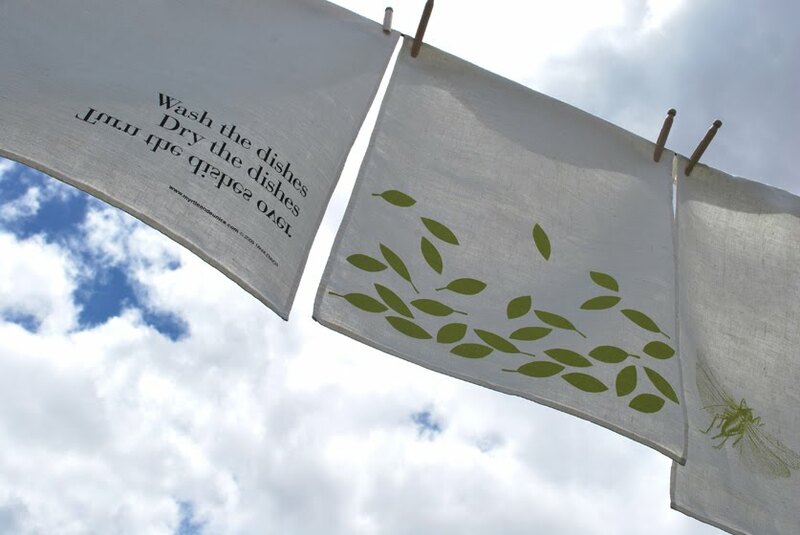 I love, love, love your tea towels - especially the "wash the dishes" one! I'd forgotten about 'wash the dishes'. Inspired! well everyone has already told you how fab they are, so I will agree. i wonder why you aren't setting up shop??? Speechless Tania - just stunning! Well done... on several accounts. Tania, u make it seem so simple, great work in such a short time, why did it take u 19 years? Well congratulations to you....this maybe your new thing!!! Yippee!! 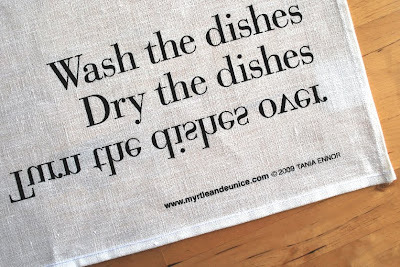 I love that wash the dishes tea towel! LOVE IT! Such a clever idea. Love them - love them. I will take one of each but especailly the writing one. You don't mind do you - not like you are doing anything else. you are SO talented. and clever. and funny. my favorite kind of girl!! I send you this link of a Dutch company which prints poems on fabics (pillows, kitchen aprons etc). look at www.plint.nl for inspiration. I love those sorts of rhymes, looks fab!! I love these - did you like the course at CAE? I want to do it early next year, not sure which one to choose though. Go, go, go. Lovely, lovely work. Gorgeous, I'd so love to buy one.....any thoughts on selling them? So cool and so clever. Now I'm considering what to do with my skanky manky excuse for tea towels. 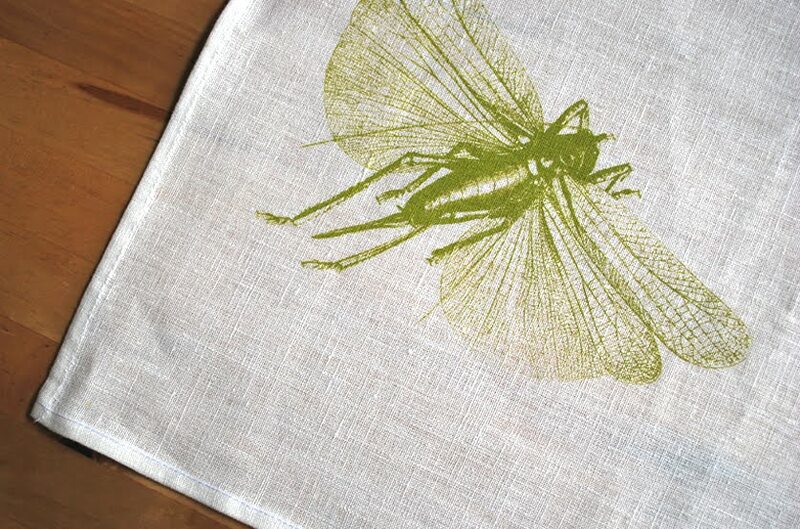 . .
What fantastic tea towels! 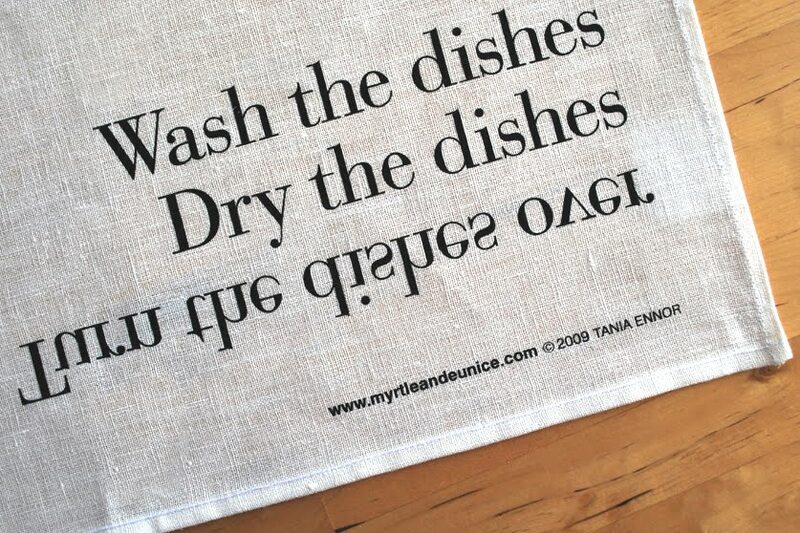 Very clever with 'turn the dishes over'. They're all gorgeous! I LOVE LOV ELOVE turn the dishes. Willing to buy one from you if I don't get you in the swap!! Wow! Yes, Turn the Dishes is especially clever. Good to see that you finally found a place to learn screen-printed. I printed dozens of tea-towels yesterday. I'm never organised enough to participate in "your creative space". I would like to own about 3700 of these. Please send them overnight delivery. Thank you. Lovely...you have me on my head now! wow, wow, wow, gorgeous darling, they really are! Tania- my two words- very cool. I love the rhyme one the most. Leaves next, less keen on the critter (personal taste)- they are all brilliantly done.